What follows is not at all scientific. The samples are small and the formats change often. But when preparing for your fantasy football draft, seeing how things have changed over the course of an offseason can be helpful. All offseason long, starting Feb. 5 and ending — well, not yet, as we still have one more going — the PFF Fantasy staff (and a handful of helpful others) have been participating in a series of mock drafts. They have ranged from the everyday PPR drafts to superflex leagues to IDP to everything in between. Over the course of the mocks, some trends have emerged, and some players have seen their draft positions rise or fall accordingly. Below, I’m taking a look at some of the notable ADPs and shifts over time based only on our series of mock drafts. As stated above, this isn’t scientific. After carving out the drafts that would have skewed the data (rookie drafts, two-QB, etc. ), the sample size is a total of nine drafts, meaning the “average” position could still swing wildly based on only a few picks — Hunter Henry still has an “ADP” of 135th in our mocks, because there just haven’t been that many drafts. And I’m lumping PPR, standard, etc., into one group. So I’m not claiming you should take our mock series ADP into your draft. But if you pick around the chaff, you can find some actionable wheat in here. Bell and Gurley were unanimously first or second in every one of our drafts. Interestingly, the general opinion appears to have swung Bell’s way over the course of the offseason — Gurley went first overall in three of our first four drafts, while Bell has gone first in four of the last five. Ultimately, you can’t really go wrong with either of these guys at first or second. Well, you can — things happen — but you won’t be wrong with either one. Process, outcome, all that. Part of this is the mere fact of availability — Barkley and the other rookies don’t always show up in drafting software before they are drafted, so it’s possible our drafters just didn’t consider him. There’s also inherent ambiguity in a player without a team. Nobody was scared of Barkley’s talent, but without knowing where he’d play and how massive his workload would be, he was simply harder to trust. As soon as Barkley became a Giant, his fantasy stock crystallized and drafting him became that much easier. McKinnon went 111th overall in our first mock, prior to free agency. When he signed in San Francisco, he moved to 56th in the next mock, then 41st in the mock after that. But he kept climbing — McKinnon averaged Pick No. 27 in Mocks 4-6, and now Pick No. 23 in Mocks 7-9. His stock has climbed all offseason as buzz surrounding the 49ers’ 2018 offense has intensified. His recent injury could keep it in check the rest of the way, which honestly might be for the best, as McKinnon — who has never had a bell-cow role in an offense — might not be able to have the kind of workload that would reward a pick as high as he’s been climbing. Brandin Cooks, New England Patriot, was the average Pick No. 24 in three mocks. 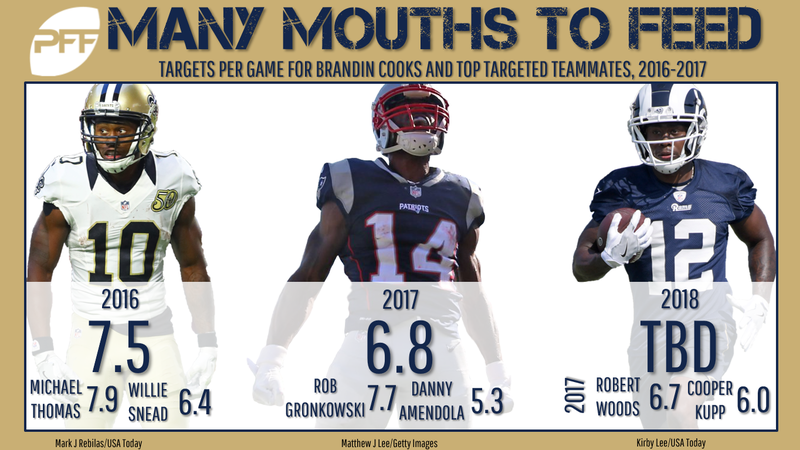 Brandin Cooks, Los Angeles Ram, has been the average Pick No. 52 in six mocks. He is still going ahead of new teammates Robert Woods and Cooper Kupp, but Cooks is no longer being drafted as a No. 1/2 WR; now, he’s going as a mid-range flex play. Our drafters haven’t decided what to make of Anderson no matter where he’s been this offseason. He went 52nd and 56th in our first and eighth drafts, respectively, and 112th and 110th in our fourth and seventh. He’s only gone within 20 picks of himself over the course of two drafts once in a span of nine mocks. With questions about how much Christian McCaffrey’s workload will grow, how many carries Cam Newton will have, and how strong the changed Carolina offensive line will be, Anderson is one of the toughest fantasy players to predict this offseason. Even ignoring the predraft picks (Chubb went 92nd, 95th, and 103rd before we knew where he’d play), Chubb’s stock has changed wildly over the offseason. When he was drafted, the Browns had Carlos Hyde and Duke Johnson Jr. already, but Chubb still went 63rd in the first post-draft mock. In the drafts since, he’s gone 75th, 78th, 99th, 92nd, and finally 119th as our drafters have gone from assuming he’ll be the starter, to wondering if it’ll be a timeshare, to now wondering how many carries he can even steal from Hyde. If Chubb does live up to where many thought he’d be after the draft, he’s turning into a potential bargain. Luck was taken in the 130s early in the offseason. The climb has been slow since, with Luck’s draft stock peaking at 95th in our most recent mock, the only time he’s gone earlier than Pick No. 111. And here’s the thing with Luck — that pick is wrong. Either Luck is back to being Luck, in which case anyone taking him around 100th is getting a steal, or he’s not healthy (yet? ), in which case this is an overbid. Luck likely has the widest range of potential fantasy outcomes of any player not named Josh Gordon or maybe Jordan Reed. I’ll just leave this here, as Miller has climbed in essentially every mock since he was drafted. Fact: you can’t do a draft with @JeffRatcliffe and end up with Anthony Miller on your team.